1. George FitzGerald – Burns: Emotive return for GF with dazzling synths and haunting vocals. Domino’s Double Six doing the business. 2. Dan Shake – Wake, Shake & Bake: Third cut from the London-based producer’s excellently-titled ‘Shakes On A Plane’, out on Lumberjacks In Hell. Akin to most of his repertoire, irresistible disco right here. 3. Dusky – Square Miso: Released Monday just gone, more 90s-influenced, piano house from Dusky. Can’t go wrong. 4 Al Zanders – Song About A Dream: Second cut from Al Zanders’ sample-heavy release on Phonica. The boy done good, watch this space. 5. Lauer – Tyco: Lauer returns to Futureboogie with a three track EP entitled ‘Las Brisas’. Industrial and balearic house from the Tuff City Kids and Talamanca System producer that we’ve come to know and love. 1. Laurence Guy – Windham Hill: After the success of his first full-length on Church, HDP alumnus Laurence Guy dropped this beautifully mellow number last week. Release date TBC. 2. Benjamin Fröhlich – Dream City: This is the stirring opener to the second part of Benjamin Fröhlich’s Rude Movements EP series, and if the first is anything to go by… It’s out on his own equally-good label, Permanent Vacation. 3. Al Zanders – There Is Rhythm: Phonica Records doing the business on Al Zanders’ next release, a two-track 12″ entitled ‘There Is Rhythm’. Hold tight for the synthy stabs after the two minute mark (and general percussive mayhem throughout). Lovely stuff. 4. Kiwi – Marmora’s Theme (Tuff City Kids Remix): Tuff City Kids serve up a tasty piano house remix for Kiwi’s first outing on Dusky’s label 17 Steps. 5. Suzanne Kraft – Nordsee: Irresistible four and a half minutes from Suzanne Kraft, covering Andreas Doreau as part of DEEK Recordings’ compilation ‘Covered In Gloria‘, a collection of covers of the likes of Roy Orbison, Wham and Oasis. Check that out here. Tim Sweeney’s Beats In Space is the label behind Mount Liberation Unlimited’s third release, ‘(Eerie) For Your Love’. The Swedish duo have prepped a two track-EP amounting to nearly twenty minutes of ‘eccentric, eclectic and electric crescendos’ – grab a copy here. Here’s the second taster from London-based label Cin Cin’s third release. It’s called ‘La Nouvelle Epoque’ and joins Ripperton’s ‘Michelada‘ that we featured t’other day. With two more tracks from the split 12” to follow (one from each artist), you can get your EP pre-orders in here. Palmbomen II is the second such alias of Holland-born producer Kai Hugo, this one said to embody the hermetical nature of the recording process, all done in his mother’s attic. All the tracks are named after bit-part X-Files characters too so you can imagine the vibe he was on. All that’s just bumpf though, the tunes are high quality low-fi electronica and well worth a listen. Chances are, if Joy Orbison and Tim Sweeney get behind a record, it’s going to be a cracker. Barnt’s ‘Chappell’ was first aired in Joy O’s essential mix back in July (well worth a listen) and has since featured in Sweeney’s Beats in Space 15th Anniversary compilation. It’s an intense percussive workout that alternates between powerful stabs and the full range of clicks and snares. Mesmerising stuff. Barnt is the latest signing to Joy O and Will Bankhead’s label ‘Hinge Finger’, with ‘His Name’ becoming the 5th vinyl-only release. The B-side is pretty tasty too, yet more weird and wonderful drum-machine sounds. Whilst warming up for his headline slot at Human Drizzle Presents with a US tour, Fort Romeau got the call-up for Tim Sweeney’s iconic Beats In Space radio show. The resulting guest mix is superb. With fine selections involving recent cuts on Hivern Discs and Live At Robert Johnson, a classic from Moby and a heart-wrenching few minutes from Lauer, nothing could whet the appetite more for his appearance at Plan B on 5th December. If you’re in London, do the right thing, get a ticket and come shake it with us. Attention Londoners! What you doing Friday 26th September? Nothing? Get yourselves down Elephant & Castle way, there’s a night you do not want to be missing. As part of a global tour covering the US, Japan, Mexico and Europe, Tim Sweeney and his merry men are celebrating 15 years of his Beats In Space radio show. Luckily for us, Tief are promoting the London leg at Corsica Studios and with the line-up they’ve put together, it’s going to be CLASS. If you’re unfamiliar with BIS, way back in ‘99, then New York University freshman Tim Sweeney hit the airwaves of WNYU 89.1 with the radio show, Beats In Space. In the 15 years he’s been running it, he’s not once missed the Tuesday night slot, playing host to a whole range of guest mixes from the likes of Four Tet, Midland, Gui Boratto, KiNK and John Talabot. Besides securing a legendary home for broadcasting eclectic, cutting edge music on a weekly basis, Sweeney set up a label for BIS in 2009, and having seen releases from Lauer, Paradis and Jee Day amongst others, he’s further developed the brand’s reputation for discovering top quality, new music. We’ve seen the DFA Records-affiliated DJ play before many times and he never disappoints. 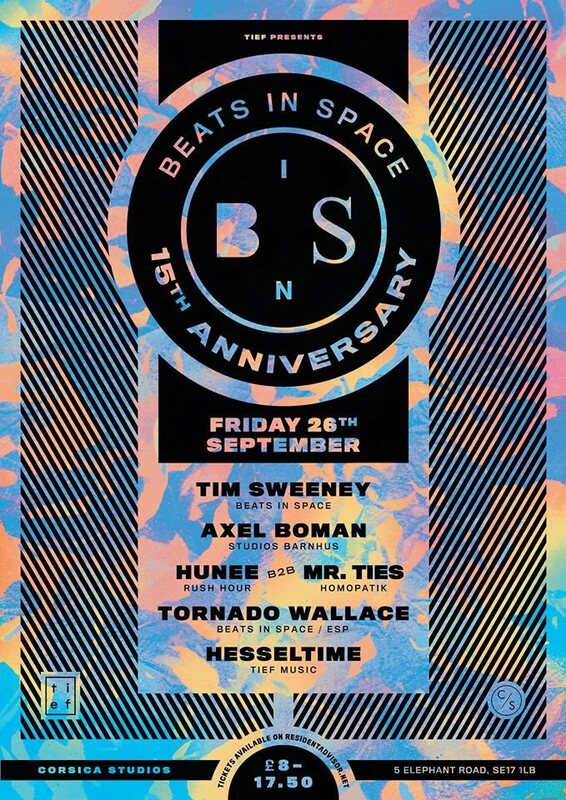 Joining him next Friday is a stellar line-up consisting of Axel Boman, Tornado Wallace, Hunee going b2b with Mr Ties, and Tief stalwart Hessletime. Get your tickets here, and delve into the below for a taster of the night. Both are out on Beats In Space and can be exchanged for money right here. 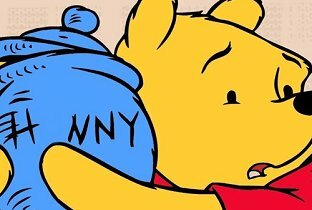 One of our favourite Swedish producers HNNY (see below for pronunciation tips) has recently joined Tim Sweeney on his Beats In Space radio show. Featuring his new track ‘Boy’, this is perfect to ease you into the weekend.